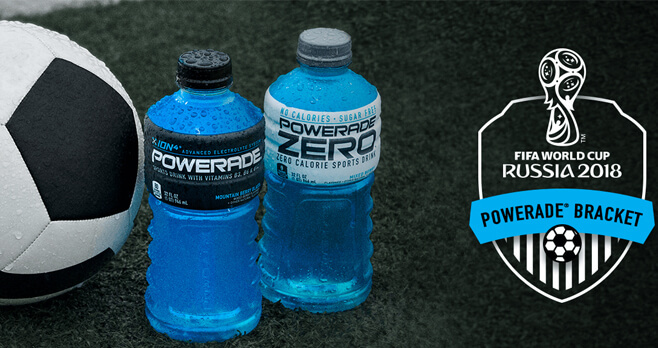 Power up for the FIFA World Cup with the POWERADE FIFA World Cup Russia 2018 Sweepstakes. Enter your product code at www.powerade.com/FIFA for your chance to win a trip to a USMNT game, a gaming console and EA Sports FIFA 18 bundle, Amazon gift cards, and more. Ends: 11:59 p.m. ET, July 31, 2018. A trip for winner and 3 guests to the USA v. MEX match in Nashville, TN on September 11, 2018. A $360 Best Buy gift card that may be used to purchase a gaming console and EA SPORTS FIFA 18 game. $20 that may be used for soccer gear. A $10 Amazon.com Gift Card. A $5 Amazon.com Gift Card that may be used to purchase an 8-pack of POWERADE. A $1,500 gift certificate for Best Buy that may be used to upgrade your home entereaintment system. Eligibility: Open only to legal residents of the 50 United States (or the District of Columbia) who are 13 years of age or older and who have a POWERADE.com account (or other Coca?Cola account) at the time of entry.